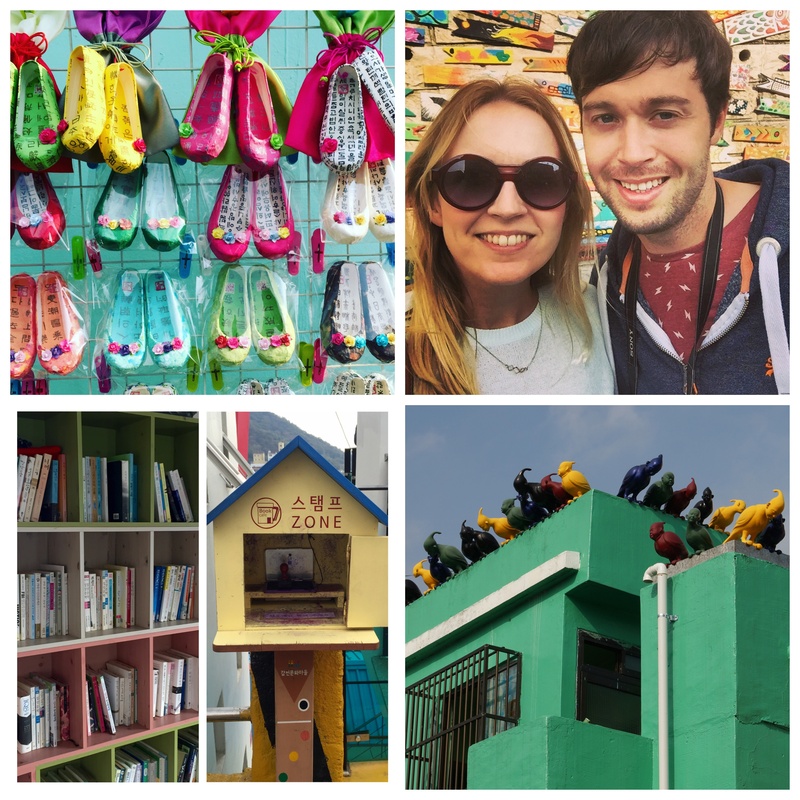 Our next country was South Korea, not usually a stop off on your average backpacker itinerary. As we had planned to visit Japan and China, it made sense to take the chance to try some authentically spicy South Korean food. We took the JR Beetle hydrofoil from Hakata Port in Fukuoka to Busan on the south east coast of South Korea. Travelling by catamaran saved us the time and hassle of airport queues, but the journey was very bumpy. As we were leaving by boat we had to pay a leaving fee and port tax (about £10 each). Probably the most famous stretch of beach in Korea, this is less of a tropical paradise and more of an urban beach hangout. Surrounded by skyscrapers, shops, restaurants and bars, the city flocks to Haeundae in East Busan on a sunny summer afternoon, where it’s almost impossible to find a space to park your towel. Luckily, our visit on a late October afternoon meant that we had the beach pretty much to ourselves. Haeundae Marketplace is famous for sea eels and puffer fish stew, two dishes we weren’t that keen on trying! It’s an interesting place to walk around and see the different street food on offer. Fried chicken is big in Korea. First introduced by US soldiers during the Korean War, Korean chefs have put their own red chilli twist on this all-American dish. We tried our first taste of the real KFC at Noo Na Hol Dak (which we think translates as oven chicken and beer) in Haeundae, near to our hostel. We tried to order the spicy chicken. The waiter told us that the original chicken was already spicy, so we went for that. He wasn’t wrong! The crispy chicken was served with pickled radish, pepper and fries. We also ordered the salt and pepper squid (which came in a basket with its own scissors) and a side salad – for health reasons. By far the best Korean fried chicken we had during our short stay in Korea. The best way to describe Gamcheon is that it is Korea’s answer to the Brazilian favelas, with local artwork added in to the mix. The pastel coloured network of settlements winding its way down the hillside towards the port is one of the most non-Korean thing you will see in Korea. Gamcheon used to be one of the poorest areas in Busan, housing many refugees from the Korean War. In 2009, the Ministry of Culture, Sports and Tourism launched a project to model the village into a creative community. Local artists have a taken over at the uppermost part of the village and developed a cultural trail. There are art installations, book exchanges, quirky cafes and craft shops. You can buy a map to take you round the sights, or just follow your nose and the crowds like we did. To get there, take Subway Line 1 to Toseong Station. Use Exit 6 and turn right at the crossroads, up by the hospital. Bus number 2 or 2-2 outside the hospital takes you up to the top of the village. The buses are very small; once you start the steep journey winding through the hills, you can see why! Gwangali is famous for its crescent-shaped beach and views of the Gwangan Bridge (Diamond Bridge). At night, when the multicoloured skyscraper lights reflect into the waves, it looks fantastic. It’s also home to one of the best microbreweries in Busan. American-run Galmegi Brewing Co. was the first craft brewery to open in Busan in 2014 and for us it was a taste of home (Leeds seems to have a new microbrewery opening up every other week). Brewed on site, the cleverly-named Seouless Ginger, a 5% golden ale brewed with Korean ginger, lemon juice and ginger beer, is crisp and refreshing. The sort of pint that makes you want to order another. They serve up some decent wood-fired pizzas and bar snacks, too. The big open space with brewing vats and long wooden tables has a good atmosphere; it was strange to be in such a familiar environment so far away from home, and especially after the tiny izakaya pubs we had come to love in Japan. Gwangali also has a good number of craft beer bottle shops – The Owl and the Pussycat caught our eye and had we been staying in Busan longer, it would definitely have been our local off licence! To get to Gwangali, take the metro to Geumnyeonsan Station. Jalgachi fish market is at the heart of Busan port’s fishing industry. The streets and streets of stalls have a dizzying array of seafood sights and smells, selling mainly to local people and local restaurants. The stalls are nearly all operated by women. This is one of the traditional hangovers of Busan; the men fish and the women sell the fish. The nearby Gukje Market has some of the best street food in the city, with simple restaurants popping up in every available space. The area’s speciality is chungmu gimbap, rolls made of dried seaweed stuffed with rice and served with spicy radish and boiled squid. Stalls were selling everything from breaded fish cakes filled with molten cheese, to battered hot dogs rolled in chips, to kimchi jjigae (kimchi stew). Even if you don’t buy anything, the markets show the traditional side of Busan which is fast disappearing with mass urbanisation and slick apartment skyscrapers. To get to both markets, take the metro to Nampo-dong Station.